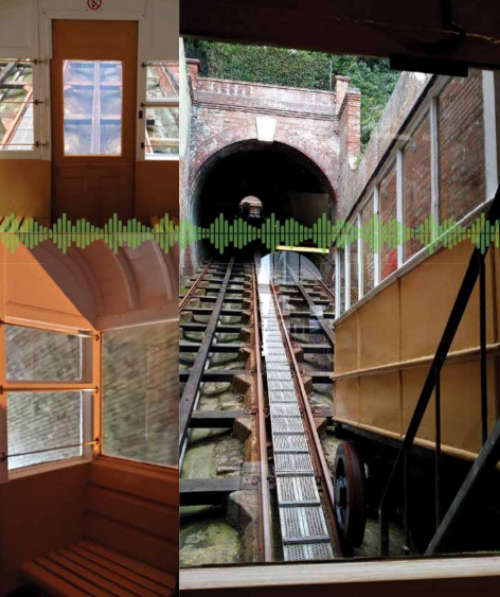 The illusion of conscious thought by Emily Peasgood is an especially commissioned sound installation for the East and West Hill funicular lifts. Peasgood will create a sound work that explores our subconscious experiences and perceptions when travelling inside them. Emily Peasgood is an award-winning composer, sound artist and visual artist. She creates research-led, multi-disciplinary work for galleries and public spaces, ranging from large-scale community events to intimate sound installations. Her work explores current aff airs, creating community, and connecting people with overlooked or forgotten places. Her work is described as magical (The Times), evocative (The Telegraph), and memorable (A-N). Recent works include: Requiem for Crossbones (Merge Bankside, 2018), Halfway to Heaven (Folkestone Triennial 2017), LIFTED (Turner Contemporary & South Bank Centre, 2016), and BASCA nominated works Crossing Over (2016) and BIRDS and other Stories (2017).